Work Sharp Knife Sharpener in Field Review - What You Need To Know! I am a fan of Work Sharp products, owning several and having purchased a few for gifts and various applications over time. In this case the Pocket Knife Sharpener is a brand new product that WorkSharp decided to allow me to test! So in this case, I did receive a product (that I will be buying more of) in exchange for a review. Please follow the links above for their website, this product is slated to be on the shelf by Fathers Day! Work Sharp is an amazing brand name, well known in the knife building and sharpening industry. An American tool company founded in 1973 under the name Darex it is a business that has remained in the family for four generations. Matthew Bernard is the fourth generation family owner of the corporation. The brands under this name are Darex industrial bit sharpeners, Drill Doctor professional and DIY drill bit sharpeners and my personal favorite the Work Sharp line of knife and tool sharpeners. Not only does Work Sharp (Darex) design and engineer their equipment in-house, they also manufacture it entirely under the same roof. Located in Jackson County, Oregon; it is based in a town of approximately 21,000 people called Ashland. Having been through that area I can say it is an absolutely beautiful place with hard-working individuals who remember the American work ethic. Makes sense as to why they chose this as their location after founding the company in Illinois, guess you could say the founders were truly forward thinkers in 1978 when they made the move out west! When I first received the Work Sharp Pocket Knife Sharpener I was hesitant, honestly, it would be difficult for them to beat the Guided Field Sharpener I own and love. After grabbing some of my knives and the new sharpener I set to work and was quickly blown away by the ease of use and performance in such a small package. I sharpened inexpensive blades and some of my more expensive ones as well. 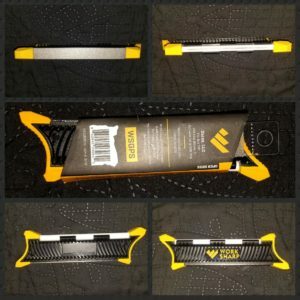 It easily allowed for quick honing and full sharpening for everything from my Morakniv blades, Schrade multi-blade pocket knife to my skinning blades and the Husqvarna camp ax that has seen me through a few cold camping trips. There are a few ways to hold the Pocket Knife Sharpener as you can see in the pictures the design allows for ease of use regardless choice in holding it. I would suggest ensuring your fingers are clear of the blade when you begin sharpening. Additionally, remember that you do not want to use excessive force when sharpening. In most cases allow the weight of the knife and a small added pressure do the work for you. The instructions say to use 10 strokes on each side of the edge and each side of the sharpener. With a few of my blades I needed to do 20 or 30 strokes and it should be noted that if you do not have to do NOT use the rough grit diamond plate side relying on a quick touch up with the ceramic rod only. Overall this is a great product and would shine in the field as a tool for hunters, fishermen and the like who need something smaller and lighter. It weighs maybe a third of the Guided Field Sharpener and will cost less than half! Here is a quick rundown of what is included with this sharpener. This is a definite addition if you need something that is compact and works! WorkSharp has this marked at $15 retail with a hold for sale at or around Fathers Day this year. Make sure to note the Work Sharp page on Amazon and check out their other amazing well-made tools! This tool gets two thumbs up with no hesitation and a definite nod towards those wanting to lighten their go bags or hunting kit! As always thanks for reading and if you have questions please do so! Your review was top notch and it must be the reason this sharpener is out of stock lol so I will watch to see when it comes back in stock and add it to my preps . Thanks for a informative review. Northernwolf, they will have it fully stocked by fathers day or a bit before! I cant wait, I’ll be adding two more to my kit! Northernwolf it is in stock as we speak! JM, nice looking knife collection….. and sharpener. This looks a lot like puppy. Thor1, now that’s smart prepping! Love it! I have several traveling knife sharpeners, plus a fixed kit at home. Dull knives hurt more people than sharp ones. Jp, absolutely true – I’ve helped my kids get the blade bug…they come to me and we sharpen together- and I love the angle guides that make it a breeze! Jesse, I’ve always been a knife fan ever since I got my first pocket knife as a Cub Scout. That one disappeared in a flood many years ago. Oh well. Thank you for a great product review. Nice to know that someone has actually used something and how it worked out. Price seems reasonable and size is something that easily fits in a pocket or small toolkit. Any ideas on local businesses that will carry this? While I am not against purchasing on Amazon, I am more in favor of paying with cash locally. Greg. honestly no idea who may have it though I would say buy it directly from WorkSharp until it comes available on Amazon – I wish Ace Hardware carried them! Thanks Jesse. I wish Ace carried them too ! I’ll look around at the various hardware/tool/big bin stores. If I have to I’ll use Amazon, just prefer to keep money local as possible and keep people here employed.